John Thorndal began practicing in Nevada in 1967. Prior to becoming a lawyer, Mr. Thorndal served as an active-duty officer in the United States Air Force. After completing active-duty, he continued as a member of the Air Force Reserve and achieved the rank of Lieutenant Colonel prior to retirement. Mr. Thorndal’s practice in Nevada is a reflection of the state’s growth. In 1967 he worked as a legal counsel for the prime contractor managing the Nevada Test Site, home to the country’s nuclear weapons testing program. 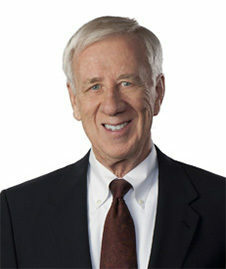 He also served as one of two Assistant United States Attorneys in Nevada prior to entering private practice in 1970. When it was founded the firm consisted of two attorneys and an assistant. Over time it has grown to its current size of over 25 attorneys with offices in both southern and northern Nevada. Mr. Thorndal presently restricts his practice to a select group of clients. For decades he served as counsel for Nevada Test Site contractors and the federal government concerning cases arising from radiation exposure and other claims at the Nevada Test Site. He has earned and maintained Martindale-Hubbell’s AV rating, the highest possible, for more than 25 years. Community service has also featured prominently in Mr. Thorndal’s career as he has been an active member of Catholic Community Services of Nevada. He served on the organization’s board, including president of the state board for two years, and as a trustee of four Catholic Charities’ corporations for low income seniors. Mr. Thorndal also served as the legal adviser to the Catholic Charity Adoption agency and volunteered his services in court proceedings involving over 175 adoptions. Mr. Thorndal’s work also led him to be an active participant in the establishment of the National Atomic Testing Museum in Las Vegas. This museum is the only Nevada museum that is an affiliate of the Smithsonian Institute and to be given a “National” title by the U.S. Congress. Mr. Thorndal presently serves as a trustee of the museum.